If duck isn’t my favorite meat, lamb is. 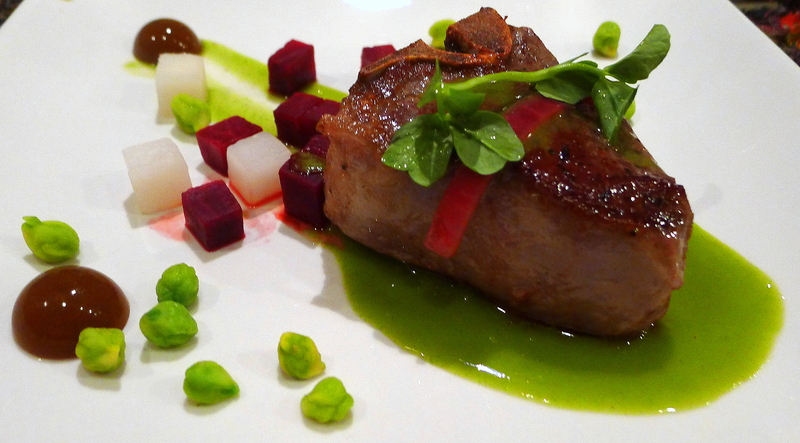 Perhaps because they are both products of the spring, lamb and sweet peas have a natural affinity. Lamb and mint, on the one hand, and mint and peas, on the other hand, are similarly natural affinities. The other defining ingredient of this recipe is the green garbanzo beans. These are the fresh version of the same thing you get as “chickpeas” in cans and from whence hummus comes. In their fresh form, though, they take on an entirely different flavor profile, more like fresh fava beans or, indeed, sweet peas. The recipe would work perfectly well with just those elements. The diced and parboiled vegetables, though, provide color contrast as well as textural interest. That, of course, is enhanced by the crispy red pickled onion and the intriguing texture of the saffron gel. The later is a bit of modern gastronomy in a recipe that doesn’t emphasize the modern. Ultimately, though, it is a dish that tastes good and is a lot easier to make than it appears. If there’s a part that worries you, omit it. If there’s an ingredient you can’t find, substitute (or omit) it. Do as much as works for you. 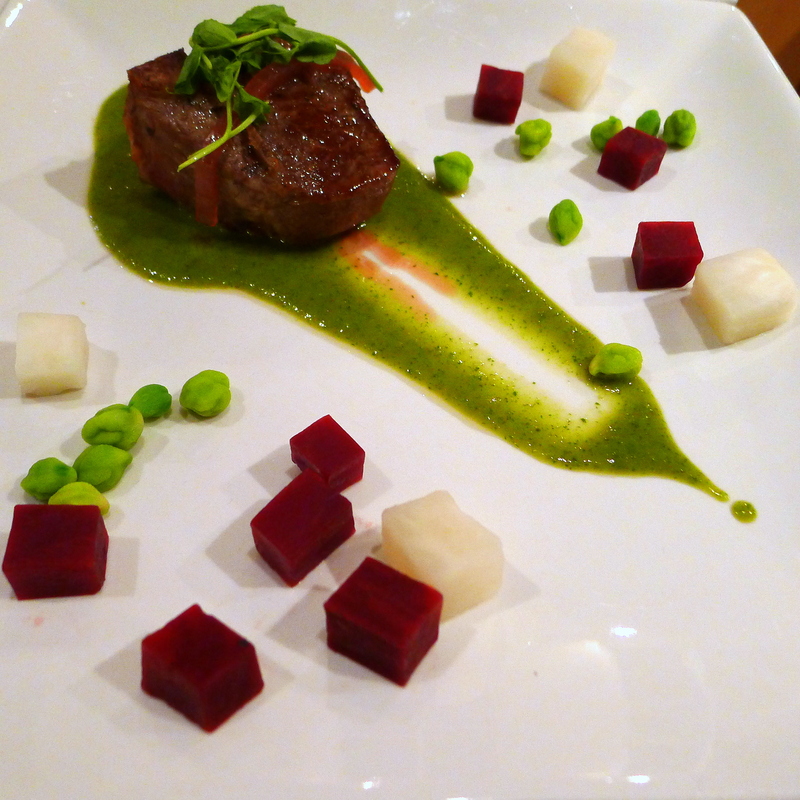 The lamb-sweet pea-mint combination is the star of the plate and so long as you focus on that you’ll like the results. Cook the Lamb Chops Sous Vide. Meanwhile, season each lamb chop liberally with salt and pepper. Vacuum seal each bag. Using a sous-vide machine, waterbath or a pot of water and a thermometer, bring the waterbath to 136° Fahrenheit. Cook the chops for one hour at that temperature. Make the Saffron Gel. Sweat the onion, ginger, carrot and celery in a sauce pan over low heat for three minutes. Add the safflower threads and chicken stock and bring to a boil. Reduce the stock to a simmer and infuse the safflower for 2 minutes before straining. Return to the heat, adding the agar agar. Bring the liquid back to a boil until the liquid visibly thickens. Pour the liquid into a tray of small molds and refrigerate until the gels are set. Make the Sweet Pea-Mint Jus. Bring a large pot of salted water to a boil for the vegetables. Meanwhile, sweat the shallots, seasoned with the salt, in the olive oil in a medium sauce pan until just translucent. Add the chicken stock and bring to a boil over high heat. Add the peas and cook until they are thawed. Turn off the burner and add the mint. Steep the mint in the sauce for two minutes. Puree in a high speed blender. Sear the Lamb Chops. Remove the lamb chops from the sous-vide and from their bags. Heat a heavy saute pan over high flame and sear the chops on both sides until they have nicely caramelized, about 2 minutes on each side. Let them rest. Parboil the Vegetables. Meanwhile, parboil each of the vegetables in turn (in a strainer) in the large pot of boiling salted water. Transfer each in turn to a separate bowl. Plate the Dish. Place a pool of the sauce on one side of each plate. Using the serving spoon (or ladle) drag the sauce to the other side of the plate in a painterly stroke. Place a lamb chop in the main part of each pool of the sweet pea-mint sauce. Arrange two gels some of the vegetables around the sauce and the lamb chop. Top each chop with a piece of the pink pickled onion and a pea shoot.